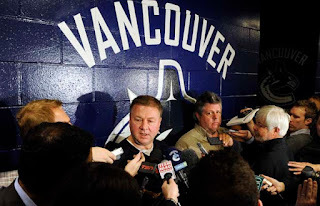 Canucks GM Mike Gillis has questioned the league's referees, and the lack of a 'level playing field' through six games of the Vancouver Canucks Western Conference Quarterfinal match up versus the Chicago Blackhawks. Found below is a video of many of the missed calls and weak calls from Game 6 that results in Gillis' frustrations. As the Province's Tony Gallagher explains, the league has a lot of reasons for wanting a series prolonged, especially for big market teams that are a huge draw for television revenues. Here is the video of Gillis' press conference. Gillis is clearly creating a diversion to draw attention away from his players in advance of a big game, and also hoping to get in the heads of the officials in an effort to get more power plays than than Chicago for Game 7, or at least the benefit of the doubt on some calls. For the latter, we will only know on Tuesday if this is the case. In the meantime, he has successfully diverted the media into discussing Mike Gillis and the officiating instead of Roberto Luongo, and the team being on the verge of a monumental collapse. Gallagher meanwhile is right (and first reported by PuckWatch), Gills remembers blatant non-calls for the previous two years as well. Missed calls on goaltender interference leading to Chicago goals, and of course the hits to Rick Rypien and Ryan Kesler that drew neither a suspension nor a minor penalty. Some Chicago bloggers and media are jumping all over this, but they must have short memories. Coach Quenneville played the media game with Raffi Torres, and generated a lot of sympathy across the league. With Game 7 on the horizon, the city of Vancouver holds its breath, and the hockey world looks on. Will Vancouver exorcise the Chicago demon, or suffer a humiliating collapse?